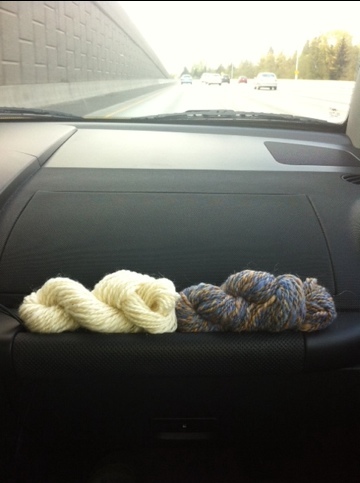 This was a new adventure for me–I’ve knit in the car, but never tried spinning before. We were headed back from Bend, OR, me armed with a new spindle and lots of fiber, and Barry with a good audio book..what more do you need? I honestly didn’t know if it would work, but there was a cool simplicity to the process that made for an amazing experience. First, you have to revert back to a “park and draft” style–especially if you are in a cute yellow beetle. Talk about tight quarters! The only part that really became uncomfortable was plying. I love that process, but I had to wonder if my husband found it annoying to have my arm reach in front of his face while he was navigating Tacoma traffic…. Now we’ll have to see if I can add this to my morning commute! This entry was posted in Car Spinning and tagged fiber, Spinning, yarn by Leah. Bookmark the permalink.